English Movie Blue Streak (1999) & Hindi movie Gol Maal (1979). 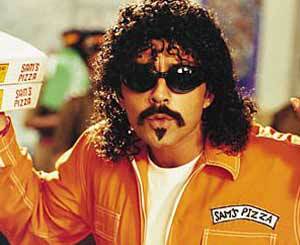 Sham (Bobby Deol), a thief is on the run from the law and desperately wants to hide a Rs 30 crore diamond. Seeing no other place, he quickly hides it at a construction site. He is caught and jailed. When he is released he comes back to the site, but finds that the under construction site is now a fully operational police station. How does he get back the diamond? Hey, presto, he becomes Inspector Ram to get access to the police headquarters. 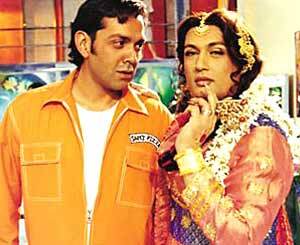 However, here he meets lady inspector Ranjita (Bipasha Basu) who falls head-over-heels in love with him. 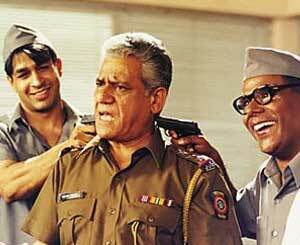 Also he has to constantly be on guard against Inspector Pande (Om Puri) who is suspicious to the extreme. 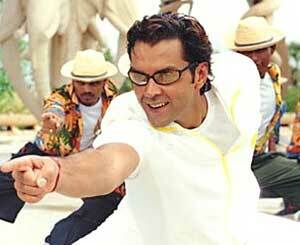 The ACP (Paresh Rawal) has a daughter Kajal (Shilpa Shetty) who funnily is in love with the ACPs driver. To make matters worse, Sham also has to outwit Tito (Ashish Vidyarthi) who pretends to be a chaiwala and is also in search of the diamond.